Why is the Premier League one of the world's greatest competitions? Why do managers set their stall out to win the title as their priority? Can the Champions League really be secondary to Messrs. Wenger, Ferguson et al? Surely the mantle of European Champion is greater than being just the domestic one? The answer's simple. Every kick of the Premier League has competitive integrity. And you can't say that about the Champions League! Manchester United's home defeat to Besiktas confirmed it. Fergie fielded kids because they didn't need the win. Mismatches are massive in the Champions League. United's group opponents were Wolfsburg, CSKA Moscow and the Turkish minnows. And guess what? the away side scored first in all three games! It's just an excuse to play more games and earn more money. The Premier League's famous for its pace, commitment and every player's never-say-die attitude from the first to the last-minute. It's an English thing. 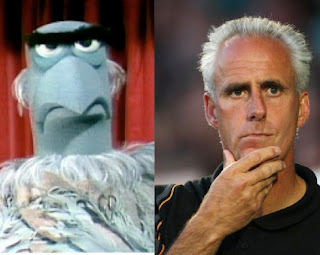 Which is why Wolves manager Mick McCarthy got crucified for fielding a deliberately weakened line-up for his team's trip to Manchester United. He changed all ten outfield players; an astonishing concession to defeat despite having steered his boys to victory at Spurs just before. McCarthy fears it could define his career. And it will. When he gets fired, you can guarantee "the Molineux faithful began turning on him after Old Trafford" will appear in reports on his demise. Wolves followed up the 3-nil defeat to United with a win over fellow relegation candidates Burnley only to get mullered at home to Manchester City to stay near the bottom. This incident is reportable only because it's so uncharacteristic of the Premier League. Not so in the Champions League. Europe's elite league needs to curtail its group stages, concentrate on pitting the Milans, Madrids and Manchesters against each other as much as possible - and separate the cack from the Kakas. "It's just an excuse to play more games and earn more money". Agree totally. Needs to go back to a straight knock-out competition.